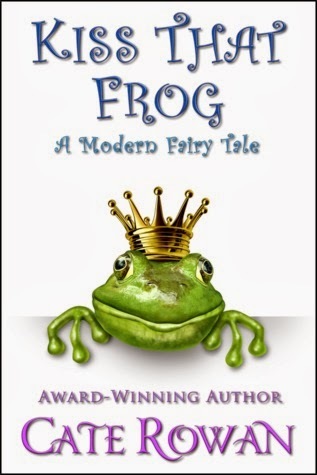 From Goodreads ~ An artist agrees to frog-sit her niece's pet, "Toad." In a moment of whimsy, between cricket feedings, she kisses the frog. A short while later, she finds a handsome man in Regency clothing in her living room. In 1820 in the kingdom of Nemerre, Prince Alexander's father, King Julian, wants him to wed. He has filled the castle with many eligible women to choose from. The problem is that Alex isn't ready to get married. He gets cornered in a room with the beautiful but unintelligent, Jesynne, and her mother. When Alex refuses to marry Jesynne, her mother, who is a witch, turns him into a frog. Fast-forward to modern day Los Angeles and Sofia is an artist. When her young niece asks her to petsit her frog, Toad, for a week, she can't say no. As the week goes on, she gets attached to the frog and just for fun gives him a kiss. Alas, nothing happens ... until after she finishes taking a shower and discovers the frog is gone and in his place is a prince! It's a cute story and I liked the writing style ... it was funny and a bit sarcastic. It was a novella so didn't take too long to read. As such, everything happens very quickly and then it's over. I think it is a great concept if the author wants to expand it into a book. I like quick reads!!! This sounds cute.